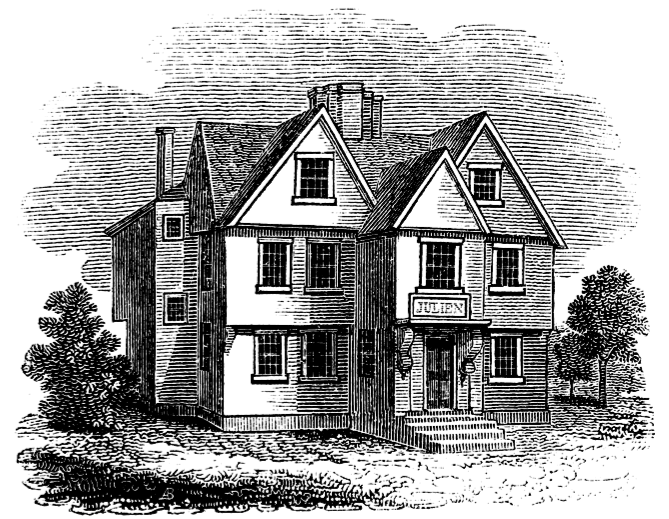 Julien’s Restorator, as depicted in Caleb Snow’s 1828 edition of the History of Boston. His first venue was in a house in Leverret’s Lane opposite the old Quaker Meeting House. Using the profits from his first year in business, Julien moved the Restorator to Milk Street. Housed in a 17th century structure, the eatery became a fixture of the Boston dining scene for the next thirty years. Julien had lived long enough in Boston to know that thrifty Yankees would not spend good money on foreign viands and well-prepared delicacies, so his advertisements for his establishment stressed the healthful nature of his food. This was to be the resort of convalescents, the infirm, and anyone else who suffered from a “lassitude of nature.” He was especially famed for his “clear and light” turtle soup, which he guaranteed was “nourishing and strengthening” for the stomach. He also catered events. This brings us back to October 21, 1797- the ship’s launching day. After a ship was safely launched, the shipwrights and laborers who had worked on the project traditionally sat down to a feast. Rum played a large role in these festivities. So did beef or pork. In this case, it looks like Julien prepared about half a barrel of beef for the shipyard hands. This would have amounted to 100 pounds or so of meat; just enough to feed about that many people. How this was prepared is anyone’s guess, but it might just have been made “alamode.” This was a popular way to prepare beef in the period and was not unlike our modern pot roast, although considerably more bacon and lard was used in the preparation. Nevertheless, the workmen who sat down to a plate of steaming beef that day might have sensed they had witnessed a historic event, but they probably had no idea that they were making culinary history as well. Documents Accompanying A Message from the President of the United States, with Sundry Statements of Expenditure; Containing Detailed Accounts of the Expenditures of Public Monies, by Naval Agents… (Washington: William Duane and Son, 1803), 20. Columbian Centinel, 13 July 1793. Boston Price Current, 29 June 1797. Beef cost between 12 and 14 dollars per barrel in Boston in 1796. Navy contracts call for twenty, ten-pound pieces in each barrel. The usual serving size for beef was between 1 and 1 ¼ pounds.